Sometimes it feels like I'm always planning my menus around items in the fridge or freezer I need to use up. The other day Matt noticed I had a bunch of half packages of phyllo and puff pastry dough in the freezer. (I always forget I have it and buy a new package.) So, this tart was a way to start working my way through them. 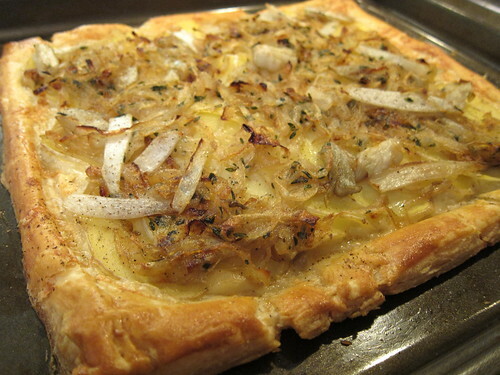 It has a classic combination of potatoes, onions and a good cheese. 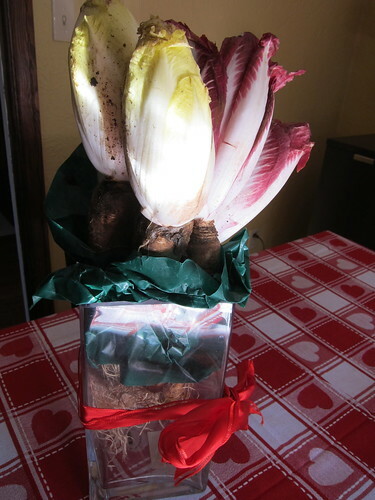 The endive was a last minute addition after I received this crazy Valentine "bouquet." If I hadn't already had the onions caramelizing, I might have skip them all together and just used the endive. Endive has a bitter taste when raw, but braised or caramelized it get a wonderful sweetness. Heat the olive oil in a skillet. Add the onions. Season with a little salt and pepper and the thyme. Let cook on low, stirring occasionally, until almost caramelized. When the onions are almost as brown as you want, add the endive. 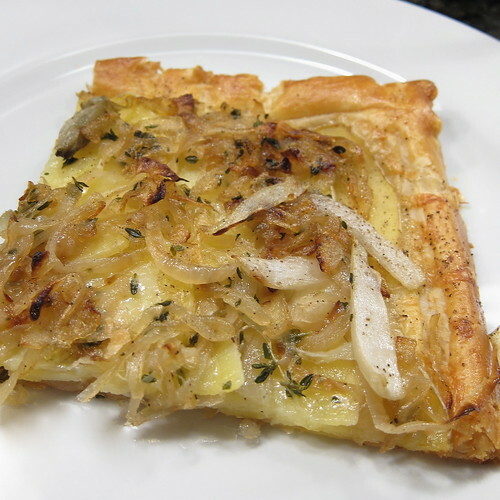 Continue cooking until both the onions and endive are brown and completely soft. Bring a large pot of salted water to a boil. Add the potato slices. Boil for 1 - 2 minutes to par-cook. Drain. Roll the puff pastry out on a baking sheet. Press it out a little. Using a sharp knife draw a border about 1/2 inch in around the whole edge of the pastry sheet WITHOUT going all the way through the dough. Use a fork to make indentations in the center square also without going through the dough. Brush with beaten egg. Spread the grated cheese evenly around the center square. Top with the potato slices overlapping them a little. Top with the onion and endive mixture. Place on center rack of preheated oven. Turn heat down to 350 F. Bake for about 20 - 25 minutes. The cheese should be melted and the pastry puffed and golden. that looks amazing, I will definitely give it a try. What a great bouquet! For once a useful present! Your tart looks delicious! breaking out the endive, eh? what a neat ingredient for a tart! What a cool, edible bouquet! This tart looks delicious!